Watford captain Troy Deeney jokingly suggested former team-mate Richarlison can expect some rough treatment when he faces his old club for Everton on Monday. Brazilian forward Richarlison impressed during his one season at Vicarage Road last term following a switch from Fluminense in August 2017. It was seen as a real coup for the Hornets when they landed him, and his promising campaign saw Everton pay a figure reported to be in the region of £45million. 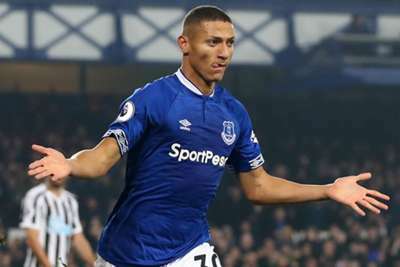 Still just 21, Richarlison has been even more impressive at Goodison Park, scoring seven times in his 13 Premier League outings, with Marco Silva playing him in a more central role. On Monday he will come up against Watford for the first time since departing, but Deeney holds no grudge about his exit, even if he suggested the Brazilian will receive a bit of a bruising. | "I don't want to talk him up too much because I’m going to have to smash him on Monday!" @T_Deeney on facing friend & former #watfordfc teammate @richarlison97 on Monday night. "I wasn't disappointed [when Richarlison left] because you can understand it," Deeney told Watford's official website. "Business-wise it was a no-brainer for the money. "You can see his potential daily, his enthusiasm for football is up there and he's now getting the national team looking at him. "But I don't want to talk him up too much because I'm going to have to smash him on Monday! On Monday he's the enemy." A win for Everton will move them back above Manchester United and into sixth, while three points for Watford will put them level with the Toffees on 23.